Dive in with TYR as we continue to fight the battle against breast cancer. 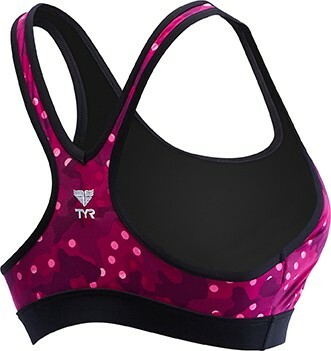 Every time you buy a TYR Pink® product-- including the TYR Pink® Women's Lyn Racerback- Cadet-- we donate up to $5.00 to the Breast Cancer Research Foundation. Designed for a dynamic lifestyle, the TYR Pink® Women's Lyn Racerback-Cadet caters to adventurists both in and out of the water. Whether it's a morning workout or a paddleboarding excursion, the BRCAB7A features the ultimate blend of comfort and function. With a vibrant print, classic coverage and removable cups, this aquatic sports bra is inspired by women who aren't afraid to sweat it out. Created with UPF 50+ technology, the fully lined BRCAB7A racerback ensures sun safety for every outdoor activity. Fast shipping and great suits. I largely use my TYR suits for activities on lakes including hiking. This top seamlessly transitions from water to land with comfort. Simultaneously too small and too large. Too tight around the band, causing sores from the thick seams. Straps are too loose, leading to rubbing around the neck area. I can't imagine a smaller size would work due to the tight band. Really disappointing.